On 14 December 2012 Uzbek citizen Yusup Kasymahunov was kidnapped in the Moscow region. It appears that he was kidnapped and taken out the country by Uzbekistan’s security services with the help of Russian border guards: Tashkent was vying for Kasymahunov’s extradition, but official extradition was stopped through efforts by the Strasbourg court and Russian human rights activists. Russian authorities and the office of the Russian representative to the European Human Rights Court (EHRC) were against the extradition, yet these warnings did not result in any action: Yusup has disappeared and is now probably in one of the detention cells in Tashkent or Andizhan. Elena Ryabinina, manager of the “Right to Shelter” programme at the Institute of Human Rights, talks in more detail about the kidnapping of Yusup Kasymahunov. On 14 December 2012 Uzbek citizen Yusup Kasymahunov disappeared in the Moscow region, four days before that he was released following a nine year jail term. Uzbek authorities have been vying for his extradition since 1999, having accused him of belonging to Hiab ut-Tahrir. The Russian side sanctioned the extradition, having totally ignored the norms of national and international laws, however the forced return of Kasymahunov to Uzbekistan was stopped by Strasburg using the 39th Rule. There is no doubt that Kasymahunov’s disappearance is a kidnapping with the aim of passing him over to the Uzbek authorities. This is an unprecedented case, despite the fact that a series of kidnappings of asylum seekers, protected from extradition by Strasbburg, has already taken place in Russia. As far as we know, the Russian authorities were not given documents in advance showing that the potential disappears can only be the result of a kidnapping. There were no previous attempts to thwart a kidnapping attempt by human rights workers with the help of the Russian representative at the European Human Rights Court. Kasymahunov’s disappearance shows that the Russian authorities, and primarily Russia’s FSB, which includes the border service, are openly violating Russian and international laws. In these conditions, asylum seekers are only safe in detention cells, since the authorities are responsible for them there. The clear parallels of this case and that of the kidnapping of Leonid Razvozjaev, it would be worth noting a significant differences. If in Razvozjaev’s case the Russian security services acted on the territory of a sovereign and cooperative state, here the security services are helping their colleagues from CIS countries to ignore the sovereignty of Russia. Born in Andijan on 15/10/1964, Yusup Kasimahunov, a teacher by training, worked in the Society to protect historical and cultural monuments, later becoming an entrepreneur selling textiles. In 1995 he moved to Russia were he continued working on his small business. At the end of 1999 Uzbek special services accused him of plotting to capture power, accusing him of being part of Hizb al-Tahrir, and in summer 2000 they sent a request to extradite him to Russia (a series of explosions took place in Tashkent in 2000, which led to further repressions). The request was not met, as this organisation was banned in Russia later – in 2003. A year after it was banned , on 13 February 2004, Kasymahunov was arrested in Moscow and in six days the Uzbek side also accused him of organising a criminal group, because the previous accusation of plotting to seize power is not punishable under Russian law. In the first 1.5 months, Yusup was held in the detention cell incommunicado. He was visited by FSB staff, who suggested he admit his guilt in being part of Hiazb al-Tahrir, in exchange for the safety of his wife and new born daughter – Russian citizens. The Uzbek security services threatened to take them to Uzbekistan. Under this pressure, he pleaded guilty, saying he was a member not only in Uzbekistan, but also in Russia. The “safety” of the eight month old girl was secured by putting her in an orphanage. Kasymahunov was sentenced to eight years in prison in a high security penal colony. This term was shortened by eight months, with one article of accusations being excluded. After the sentence came into effect, Yusup declared that he had reviewed his opinions and left Hiazb ut-Tahrir, explaining this be saying that he could never have previously imagined that human rights could be so strongly defended by people who did not share his views. Served his term? Extradite him! In June 2011, a day before his term was up, the colony’s court ruled to keep him in prison due to the renewal of the extradition case. 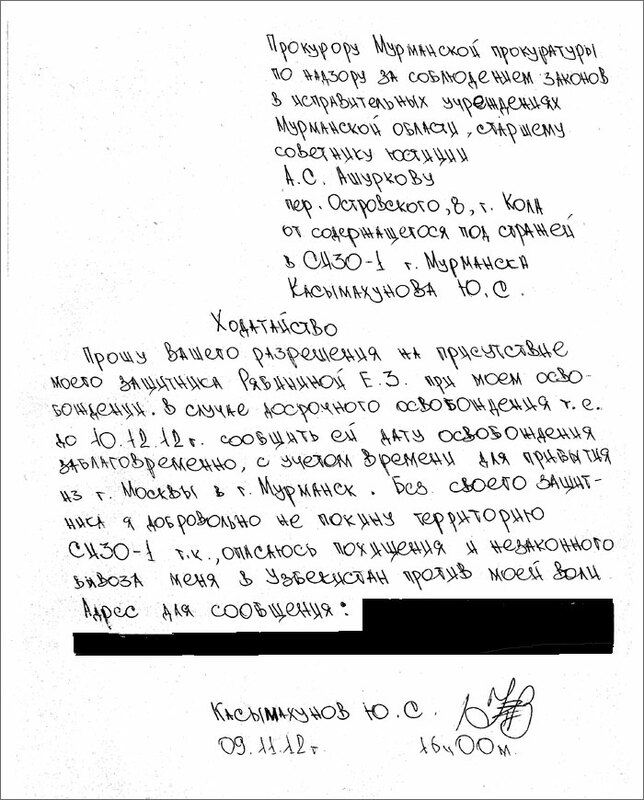 In April 2011, the Russian General Prosecutor ruled to extradite him to Uzbekistan, yet this was not carried out because it was stopped by the European Court. On the day of his release, he was sent to detention centre 1 in Murmansk. He was moved there by the security services and did not get his hands on his release certificate for the next 1.5 years. Almost at the same time, the Uzbek side added to their accusations with three more articles, but one of the articles did not allow the Russian side to extradite the prisoner. Finally, in order to align the legal position, the Uzbek prosecutors changed the language to suit the Russian law. The Russian general prosecutor then ruled that the prisoner could be extradited. We previously reported on the Yusupov case. The Supreme Court totally ignored the recommendations of its own plenary session for the appeal on 18 July 2012, however the extradition could not take place, because the European Court had already indicated that Kasymahunov could not be forcibly given over to the Uzbek authorities. Yusup wrote two statements when expecting his release. The first – for his defence lawyer, that if he suddenly disappeared in Russia and was then found in Uzbekistan, this would mean that he was kidnapped and forcibly taken there. He indicated that he does not intend to return there himself under any conditions, knowing that he will be met with torture and an unjust court. The second was an appeal to the Murmansk prosecutor asking his defence lawyer to be allowed to see the entire procedure of administering his release, as he is afraid of kidnapping, he will not leave the detention centre without his defence team. His release took place on 10 December 2012 and he was placed in the care of his defence lawyer Elena Ryabinina. The release took place in front of her, two lawyers, two prosecutors and almost the entire administrative team of the detention centre. Yusup then went to Moscow, the following day he submitted an appeal seeking temporary asylum in Russia and went to the Verbliki village, where a flat had already been rented for him. On 12 December Yusup noticed that all his movements are being watched by two cars. His defence lawyer immediately contacted the Russian Representative at the European Human Rights Court and asked them to take the appropriate measures to thwart his kidnapping. On the evening of 14 December around 11 pm his phone was off, so Kiril Koroteev and Elena Ryabinia, his representatives, went to the village to see for themselves. The door to Yusup’s flat was locked and undamaged, there were no signs of a struggle on the stairway and there was nothing out of place. His defence team reported him missing, saying it had to be a kidnapping with the aim of illegal extradition. Nevertheless, they were explained that the case will only be investigated the following day. It then emerged that Kasymahunov called his landlady around 13:20 asking for some household tools and was asking her about where he could take out the rubbish. She told him to come over for the tools when he is ready, but to call before. He never called. The flat had no signs of struggle and looked as if its inhabitant went out for just a few minutes. The bin was empty, so he may have gone to take out the rubbish. It later emerged that the cars outside Yusup’s home were there on 14 December, but were not there by the middle of the day. Three flights went to Uzbekistan from Moscow airports on the night of 14 December, two to Tashkent and one to Andijan. Given the above evidence, human rights activists and Yusup’s defence team believe that he is being held in Uzbekistan, either in Tashkent or Andijan.